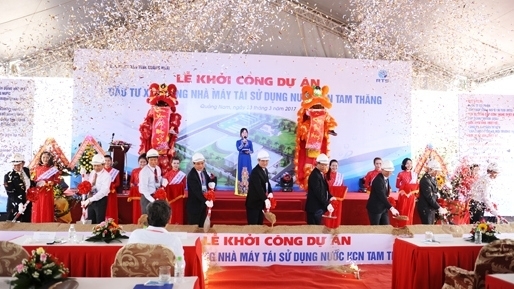 The People's Committee of the central province of Quang Nam commenced construction on a state-of-the-art water recycling plant in Tam Thang Industrial Zone, Tam Ky City on March 23. 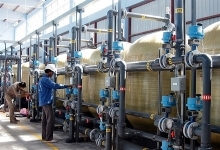 The project has a total investment of VND230 billion (US$10 million) invested by the Hanoi-based Tai Tao (Renewable) Technology Solutions JSC while US Evoqua Water Technologies has been assigned as the project’s equipment supplier. The project is also being implemented as part of celebrations for the 20th anniversary of Quang Nam’s re-establishment of (1997-2017). The facility covers an area of 2.4 ha with a designed recycling capacity of 26,000 m3/day divided into two phases: Phase 1 with a designed capacity of 13,000 m3 per day, expected to be completed in 2017 and Phase 2 with a capacity of 13,000 m3/day scheduled to be built and completed within the next two years. The project is applying advanced technology from the US, combined with UF and Ozone membranes to recover and recycle treated wastewater discharged from the Tam Thang Industrial Park’s wastewater treatment plant with water quality reaching standards of clean water supplying to production of factories in Tam Thang Industrial Zone. The modern technology is being applied in Vietnam for the first time. Speaking at the ground-breaking ceremony, Le Van Thanh, Deputy Chairman of Quang Nam People's Committee said that the project when completed and put into operation will help contribute significantly to water environmental control in the Tam Thang IZ, save clean water in Tam Ky City and reduce production costs for investors, especially textile and garment enterprises in Tam Thang Industrial Park, contributing to sustainable industrial development in Quang Nam. In addition to meeting the demand for clean water for production and residents living in the industrial zone, the project also contributes to raise awareness on clean water saving among workers in the industrial park, as well as local people. Thanh also asked local relevant authorities to actively support and create favourable conditions for the investor during the process, while urging the company to mobilise resources and advanced technology to implement the project and put the plant into operation on schedule.